See that picture up there? See those spherical yellow blooms, looking all Whoville-ish? They're just so cute that you expect to see Horton show up, don't you? Those cute little puffballs are pure evil. Those are flowers on the branches of the Huisache(WHEE-SATCH) tree. 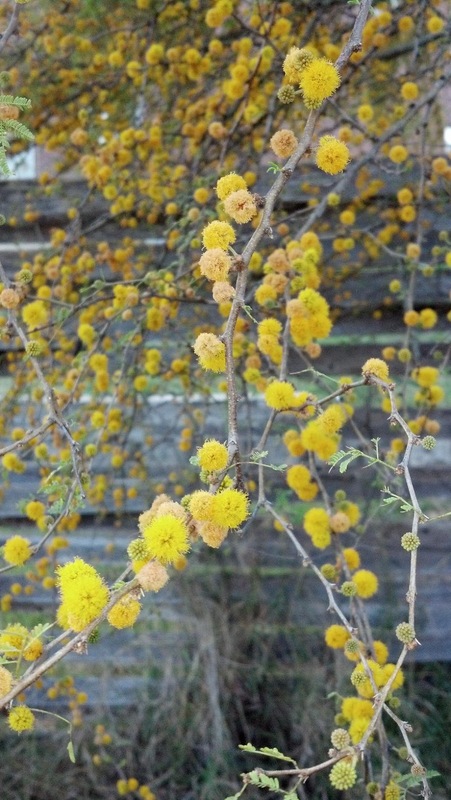 At least I think it is a Huisache tree. Obviously, Google feels the same way that I do about this tree, because they wouldn't give me a straight answer one way or the other. I had no idea how many of these freakin' trees were around my house, until THEY ALL TURNED YELLOW AND PUFFY AT THE SAME TIME. When I first arrived in Texas, I wasn't allergic to anything. But over time, my immune system has been randomly deciding to be allergic to odd things. I used to be allergic to cedar, but not anymore. No, now I'm allergic to live oak and Huisache trees. So it's the first day back at work for me after a lovely spring break, and I'm all puffy because of the Red Tide, AND I've lost the ability to breathe through my nose. And the ability to see, because I want to scratch my eyes out, when tears aren't pouring out of them. By the end of the day, I will have lost my voice, too. At least my husband will be happy. Are you allergic to any pollen-like substance? Do you have any weirdly named trees in your part of the world? I grew up in Austin, the cedar fever capital of the world, and NEVER had any allergies at all.My poor mother wheezed and sneezed through half the year, and I never understood what was wrong with her. But now that I've lived in LA for the last 25 years, every time I go back to Texas I get HIT with it. It's the worst! See? The pollen is mad at you for leaving the state! AAAAAAA-CHOO!!!!! I feel like I am allergic to something new every season. I am considering going for testing to find out just what it is.